"Whether you're new to jogging or are a seasoned marathoner, there are tons of great iPhone apps and accessories will help you to be the best runner you can possibly be." The iPhone is the perfect companion for those looking to get into jogging or running, or those looking to keep their long-term training fun and fresh. Since it's health and Fitness month here at iMore and the Mobile Nations network, we're going to take a look a the very best accessories and apps that'll help you get the most out of your experience. One important thing to remember before getting started is to always keep yourself properly hydrated when going on a run. Keeping a water bottle with you is a great idea, but if you can't, make sure to get a good amount of hydration during your warmup and cool down periods. The fact is, when you run, you sweat. A lot. Whether it's just a quick jog or a long, 10-15 mile run, proper hydration is absolutely essential to keeping your body going without over-stressing your cardiovascular system. 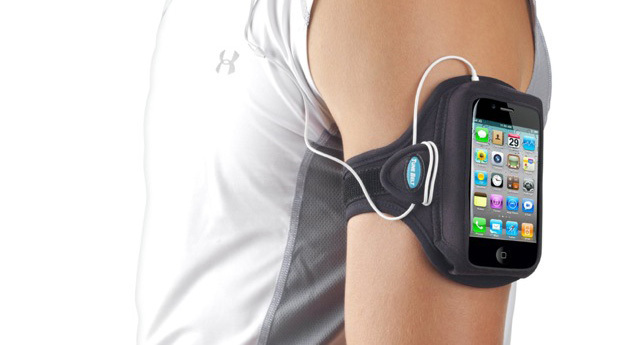 The Tune Best Armband is the best armband out there for both heavy running and light jogging. It features a protective window cover and washable material, with support for right side up or upside down orientation to match every type of workout you can imagine. Attach it to your arm or even your thigh with the EX3 length extender pushing it beyond the default 9-17 inch adjustment options if needed (EX3 sold separately). The dual-orientation also makes for a more convenient way to access your iPhone without requiring you to remove it from the armband. Just extend your arm up to eye level, and you can navigate through your iPhone without the hassle of stopping, removing it from the case, and tapping through to what you need. The great thing about the Tune Best Armband is the stretchable form-fitting material, which supports newer iPhone models as well as the older, bulkier iPhone 3G and iPhone 3GS. You'll never have to stress about your iPhone being exposed to water damage if you're running out in the rain or snow with the water-proof design, and the protective front cover ensures a scratch-resistant environment in case you happen to slip or fall while you're out on a jog in less than ideal weather. For safety nuts, the Tune Best Armband includes a highly reflective logo for night jogging, and you won't have to worry about your earbud cord getting in the way with the built-in cord organizer. Just wrap your earbud cable around the flap for a tangle-free experience! For runners, the Tune Belt Sport Armband is definitely the way to go. Polk offers both cheaper and premium alternatives, and because of the design, the UltraFit don't block out all noise -- so you can hear cars getting close or friends complaining when you leave them in the dust. The hire end models also include remote controls on the cables to easily control your audio apps without fussing with your iPhone. The app also includes full iPod integration, so you won't have to jump out of the app and into music library in order to change tracks or switch to another playlist. In addition, RunKeeper includes audio prompts that cycle through your headphones to give you information and updates on your run without any user input required. If you're new to running or if you've been running for a while, RunKeeper is definitely the first app you'll want to look into. 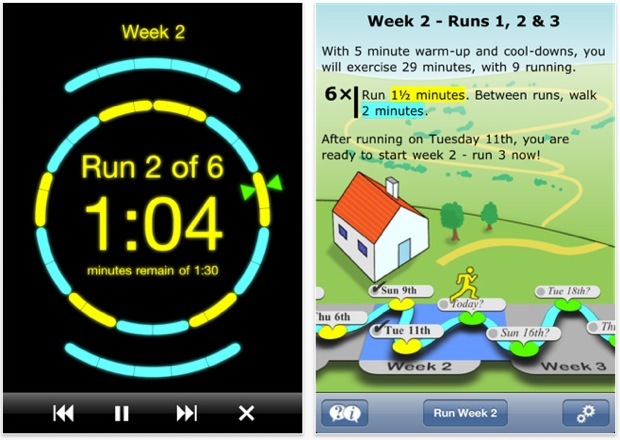 Get Running is an app for new runners. This little gem of an app will get you running for a full 30 minutes, non-stop, by integrating three daily workouts over a nine-week period, starting slow and building up to the ability to finish a full 5K run! Get Running is the only 5K running app that coaches you up like an actual human coach would, so you'll feel more motivated to keep progressing as you go through the program. By encouraging you to keep moving forward, you'll be able to run a full 5K stretch in no time! If you're new to running and want to make the process a bit less scary, Get Running is the app for you! 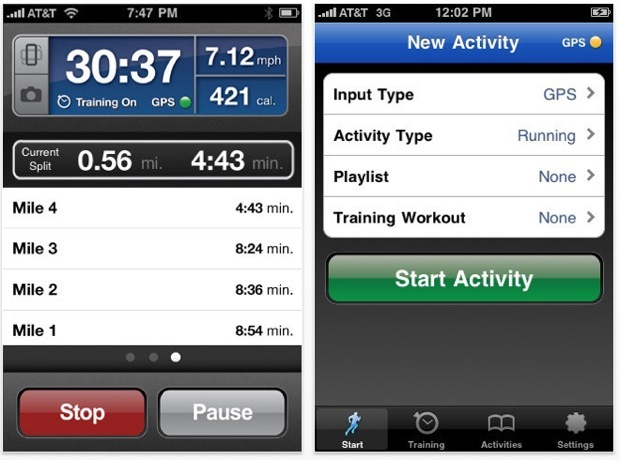 iMapMyRun is a more basic running app that does exactly what the title implies. It maps your run and gives you information related to your run, such as pace, distance, caloric output, nutrition information, elevation, heart rate stats and features a live route map update in real-time as you go. The app offers great social integration as well, so if you're into building up your bragging rights amongst fellow runners, iMapMyRun+ offers an always up-to-date list of the latest runs you or your friends have been on. Just like RunKeeper, iMapMyRun+ features voice prompts to update you with all of these stats on-the-go so you don't have to stop and check the app to see how you're doing. You also have the option of posting bragging rights to Twitter and Facebook if you want to keep your friends up to date on how you're doing. It also includes full iPod integration with a GPS camera. The free app comes with ads, so you'll have to purchase the full app if you don't want that to become an annoyance for you. 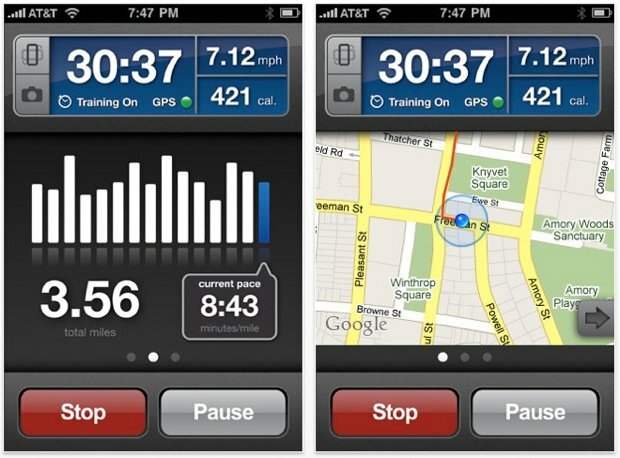 Whether you're new to jogging or are a seasoned marathoner, there are tons of great iPhone apps and accessories will help you to be the best runner you can possibly be. I've been using these apps and accessories to help get in shape, and I couldn't have picked a better device to assist in the process. 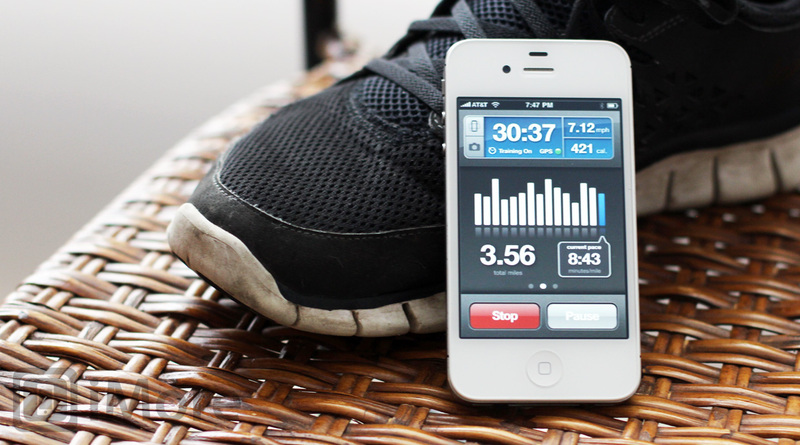 The iPhone -- paired with these apps and accessories -- is the perfect solution for running and jogging. If you have any additional accessories or apps that you consider the best-of-the-best, make sure to mention them in the comments below. And if you’re joining us for Mobile Nations Fitness Month, and running or jogging is your exercise of choice, jump into our Health & Fitness Forum and work out with us!